Variations of an essentially spherical form, the Bubble Lamp series is a distinguished and timeless George Nelson design. The Nelson Pear Bubble Pendant has an accentuated flare towards the centre and delicately floats overhead. 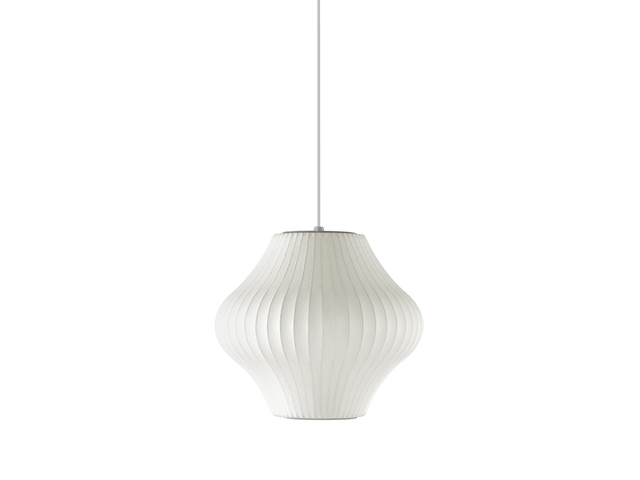 This pendant light is available in two sizes: small and medium. In 1952, a set of Swedish hanging lamps were introduced into the American market and George Nelson was impressed enough to want one for his office. A steep price tag at the time, prevented him from buying one but it also inspired him to design his own. Soon after, a collection of pendants, sconces, tripods, table, and floor lamps were born. Complete with a nickel-plated steel ceiling plate and a 6-foot cord.